WordPress is the most popular CMS being used today, it will allow you to create all kinds of websites, from blogs to advanced business websites and eCommerce stores. It’s popularity is due to it’s versatility but also how easy it is to learn and start building a website with – it’s open source which means you can download it for free from the WordPress website or you can signup for a hosting company which provides it as part of their plans, most hosts even have one-click installations these days so it couldn’t be easier to get started with it. Once you have WordPress installed, you should start to think about what functionality you need your website to have. Out of the box WordPress can handle blog posts and pages but you will probably need more functionality than that. That is where plugins come in, these are add-ons for WordPress which provide different pieces of functionality such as you might want to add a slider to your homepage to or an image gallery to display photos of your work. You might also need a contact form for people to get in touch with you, a booking system or a calendar. Once you have the functionality you need, the next step is to pick a theme, a WordPress theme provides the design and look of your website and is probably the most important part of creating your site. You will need one that is tailored to your industry, fast-loading, easy to use, responsive and so on. 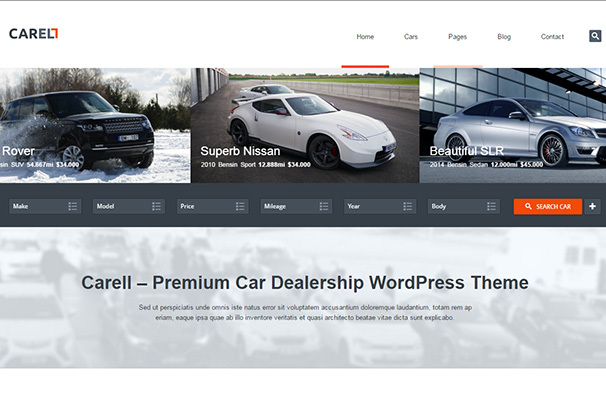 Car manufacturers, workshops, mechanics, Garages, repair shops, rental services and driving schools are all catered to by WordPress theme developers – using WordPress and one of our hand-picked selection of themes below you can have your Car website up and running in no time at all. These themes all have modern designs and have been coded with the exact features you need to run your automotive based website. Enjoy our collection of over 45 of the Best Car and Auto WordPress themes and get started building your new website! 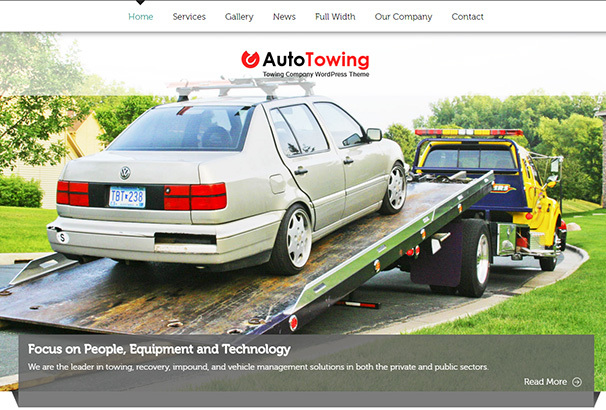 Auto Towing is a website theme that is highly multipurpose and can be used for various purposes. The theme comes with a really sleek and contemporary interface that is very responsive as well. The layout helps convey to the viewers what your website is all about with stylish imagery and brief text. In addition to that it has a really smart header layout which makes your website easy to navigate. 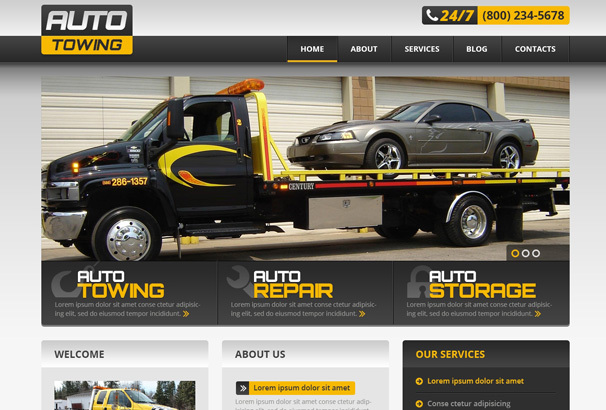 The perfect theme for business and service companies, Auto Towing helps you create an amazing website. 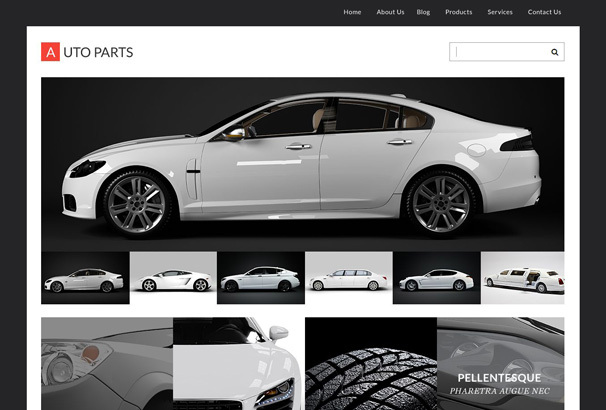 This automotive theme is designed particularly for a blog about auto parts or an online business dealing in auto parts. The theme comes with a really responsive interface that is very simple and minimal. In addition to that it also comes with parallax scrolling making your website very easy to navigate and user-friendly. The classic black and white colour scheme paired with the minimal interface makes this theme a really fantastic one. The ultimate theme for a car rental business, Car Rental comes with an awesome tile-based design. In each tile you get to upload images of cars and add descriptions as well for the ease of the users. In addition to that the theme comes with a really funky black and yellow colour scheme truly making your website really catchy and appealing. 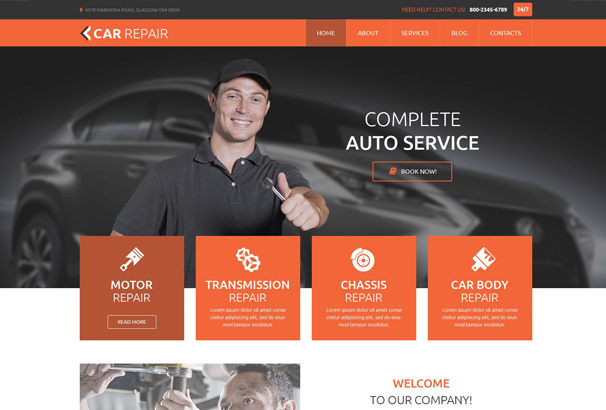 For all the people that need a really professional and corporate website for their car repair business, Car Repair helps create a really amazing website. 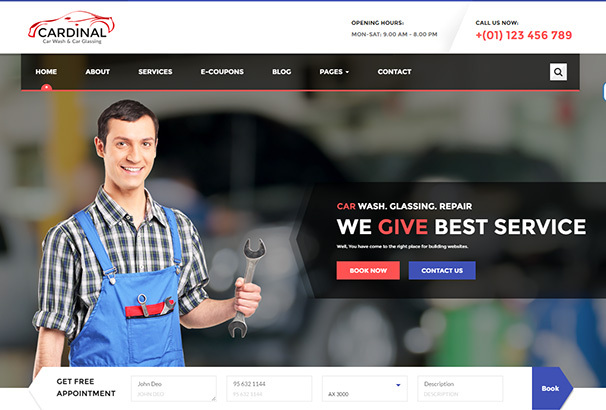 Whether you want to build an all new website for yourself or you simply want to add a fresh touch to your existing website, Car Repair has both the efficiency and the style to make your website stand out. Car Repair comes with a really classy black and red interface that makes your services stand out. This theme is also SEO optimized so you don’t have to worry about your popularity either. 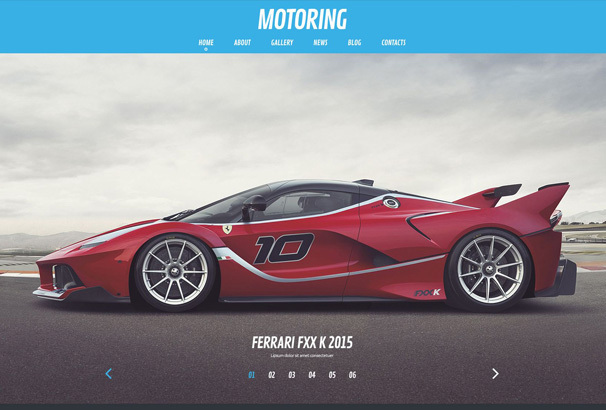 This automotive website theme is designed particularly for motor sports. The theme has a design and interface that is very aesthetically pleasing and comes with a really soft and cool colour scheme. Motoring focuses on providing maximum attention to your products and services. In the backdrop of a really subtle layout this theme promises to highlight your content. The theme also comes with a lot of amazing features making this theme not only an elegant but a really efficient one as well. 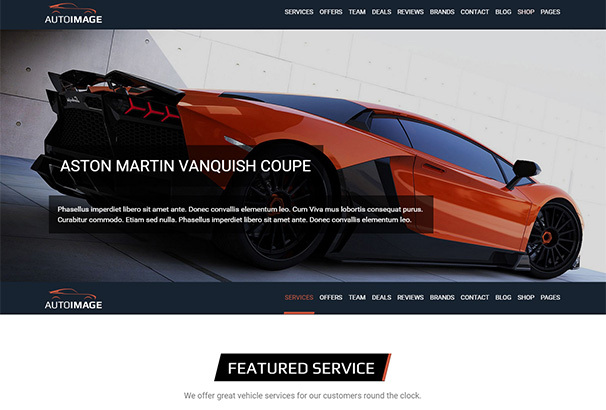 The ultimate website theme for your online car maintenance and care shop, Car Care has a really sleek and contemporary interface that gives your website a really modern vibe. With the black and grey colour scheme and hues of white and yellow make this theme really pleasing to the eye. 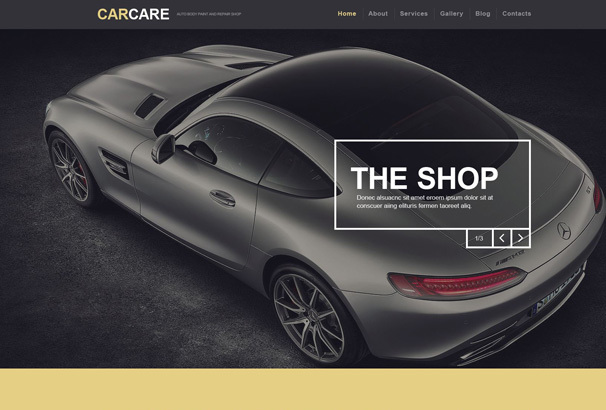 Car Care also comes with the ability to help you create the complete online store. Without even touching a single line of code, using this theme allows you to create an amazing website in very little time. Powered by the amazing Cherry Framework this theme is one of the most contemporary and versatile themes that we have. Not only does it have a really creative retina-ready interface, Car Workshop also has amazing presentation when it comes to your content. In addition to that this theme has all the features necessary to make it one of the most efficient and smooth running multipurpose themes that we have. 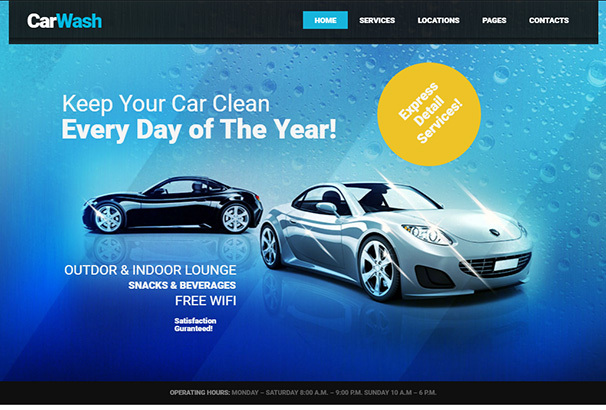 Car Wash is the perfect website theme for a car wash or a garage. Whether you’re an established business or you’re just starting off, this theme has everything that you need to create one amazing website for yourself. With simplistic and to-the-point interface paired with highly efficient features, Car Wash is one of the most flexible and user friendly themes that we have. The ideal website theme for a car towing or repair business, Car Towing is a theme that helps you create a really responsive, creative and multipurpose website for yourself. It has a really classy black, white and yellow colour scheme that grabs the attention of all your viewers. In addition to that the theme also comes with a lot of great features and high speed making it one of the most efficient themes that we have. 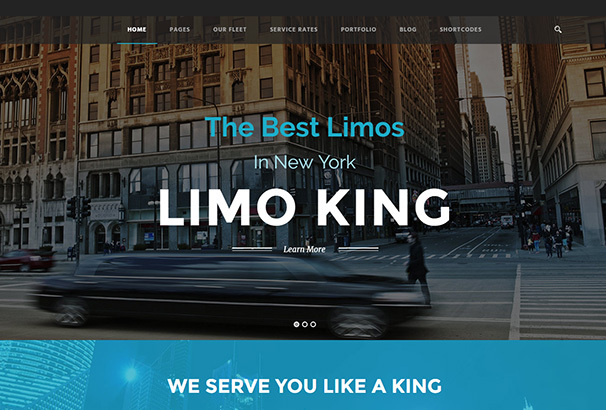 The perfect website theme to help people create a really beautiful and responsive website for a limousine business, Limo King has all that you could possibly want. The theme comes with a really informative and engaging interface that showcases all the necessary information including the limo fleet layout, fleet rates table and a really elegant booking form as well. The theme helps users book limos very easily online and sends an email to the admin as well whenever someone books a limo. To make this theme all the more amazing, Limo King is also WooCommerce integrated and comes with the WPML plugin as well. 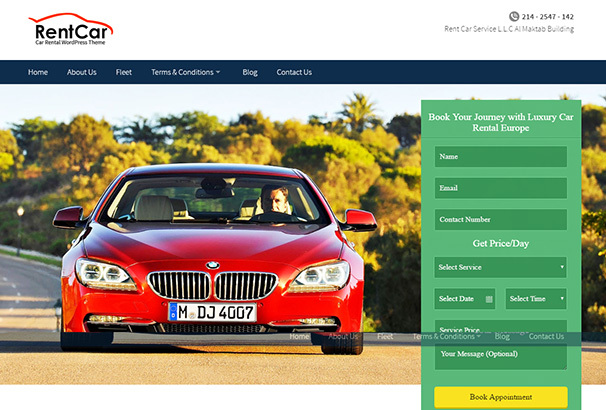 A website theme particularly designed for car rental services, Auto Rent is a really efficient and modern website theme. 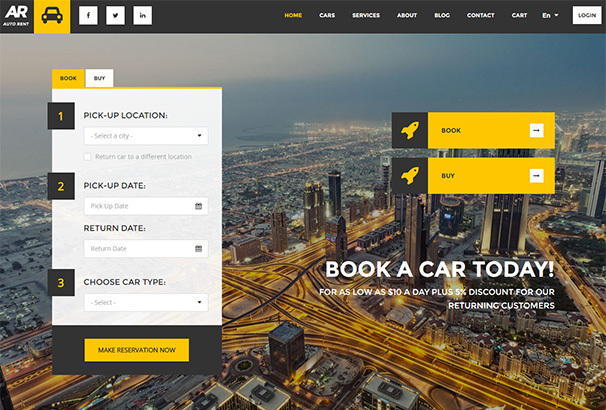 The theme has a really contemporary and direct interface that allows you to book your car as soon as you open the main page with the systematic booking feature. With a really fast filtering system and an instant search feature, Auto Rent allows your users to book vehicles in very little time with no work at all. 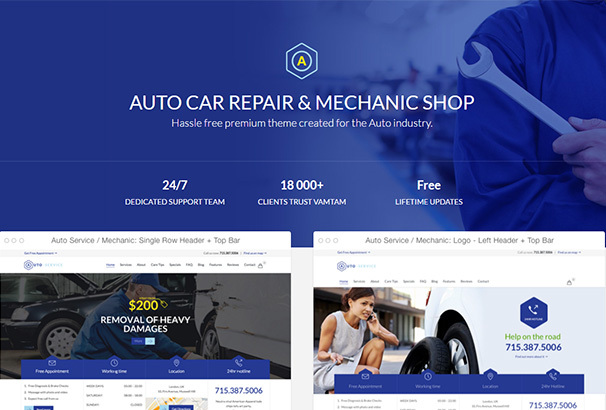 Automan is a really contemporary and modern website theme that is perfect for all sorts of automotive purposes be it car repair, rental or dealing services. Automan has a really simple and elegant interface that displays a slick car and the headers as well in a really sophisticated way. In addition to the design Automan also comes with a lot of great features including a blog section, a gallery and an online store as well due to the WoocCommerce integration. 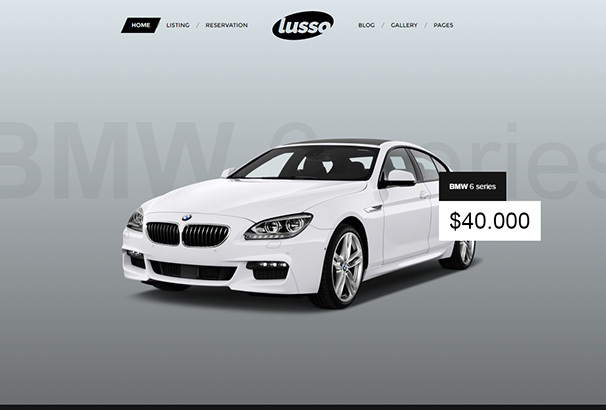 The perfect website theme for an online car rental service, Lusso has the classiest and most contemporary design. With its sleek and simplistic interface it appeals to all the users and helps increase the popularity of your business. In addition to the design the theme also comes with a lot of great features including a blog section, a gallery section and the option to choose from pages as well. 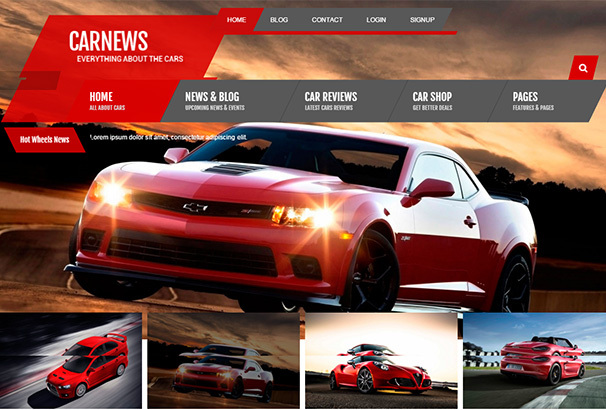 The ultimate website theme for all car and vehicle news and informative websites, Car News has a really creative and contemporary interface that attracts viewers. In addition to its sleek and modern design Car News makes a statement with its features as well. Using this theme you let your users create profiles as well in addition to providing contact information as well. 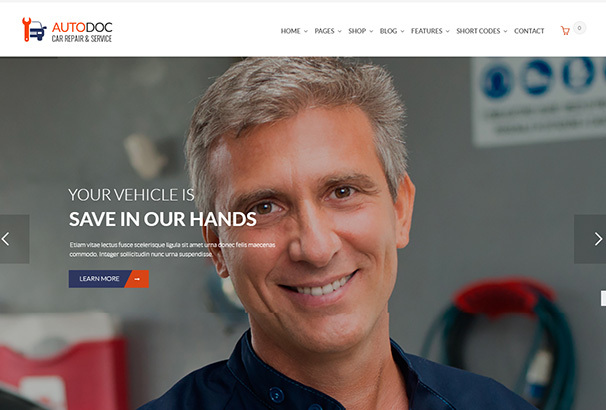 The perfect website theme for auto mechanic, mechanic workshops and car repair workshops, Auto Doc has everything that you need. This theme is a really professional and contemporary theme that is highly multipurpose. The theme is also WooCommerce integrated to allow you to create your very own online business in addition to providing your services. Transfers is a multipurpose website theme particularly for transport and car hiring businesses. This theme has a really simple and futuristic interface that minimizes the gimmicks and displays all the major content. In addition to that the theme also comes with a lot of amazing features including WooCommerce integration so you can not only sell your products but your services as well. 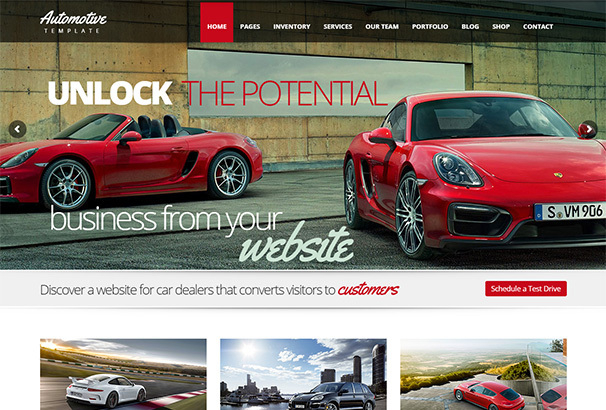 Motors is a website theme that is really versatile and multipurpose website theme. The perfect theme for promoting your services and products and running an online store, Motors is the perfect theme for all automotive uses. Whether you’re a car dealing business, a repair or mechanic shop or even anything related to businesses, Motors has everything you need. Garage is a really multipurpose, professional and flexible website theme that helps creative amazing automotive websites. The theme has a really rustic and appealing interface and displays all the services and features on the main slider. Garage also comes with a really efficient contact form 7 and has a google map plugin as well so users can easily located you. In addition to all other features Garage has an appointment button and a MailChimp integration as well so you can add newsletters to your website as well. 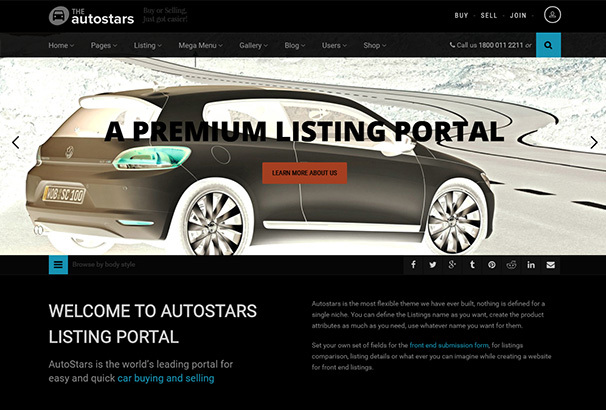 Auto Stars is a really flexible and multipurpose website theme that is designed for all sorts of automotive purposes. It has a really creative and stylish interface that displays your brand info and all your products in a really catchy and creative manner. Using this theme you get to run an online store as well. Your users get to create profiles on your website as well. Auto Stars is the perfect blend of style and efficiency. 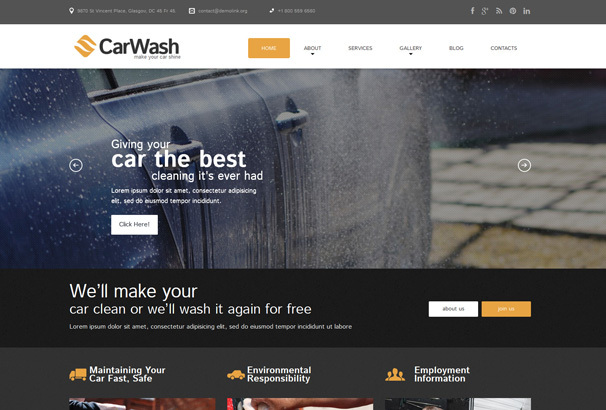 CarWash is a really professional and attractive website theme that is very versatile and highly multipurpose. This theme comes with a really responsive and engaging interface. Using CarWash you get to display your content in a really clean and simplistic manner. Built on the powerful Visual Composer the theme also comes with a number of great features like the essential grid, PO composer, revolution slider among other great features. 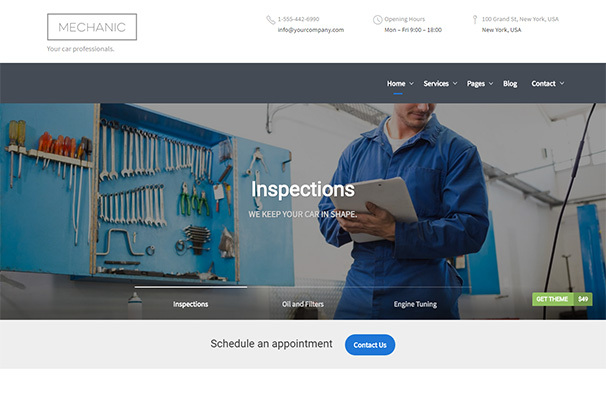 Mechanic is a really smart and intuitive website theme that is perfect for all sorts of automotive related uses. It has a really responsive and clean interface that displays your content in a really organized and structured way. This theme is very professional and user friendly and comes with a lot of great features. 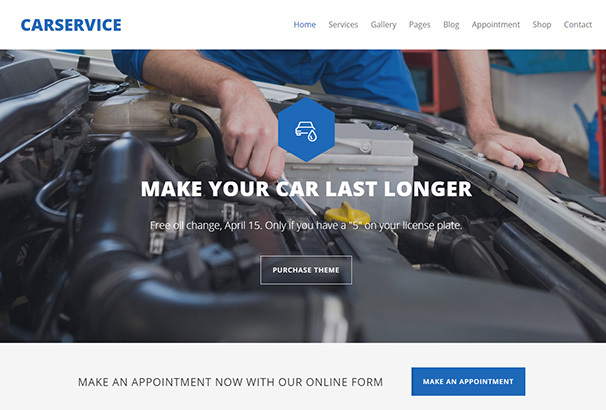 A really responsive and retina-ready website theme, Car Service is the ideal option for auto body shops, car mechanic businesses and auto repair services. Car Service has a really simple and clean interface that minimizes the clutter and puts all the attention on your products and services. In addition to that the theme also comes with WooCommerce integration and a lot of other amazing features that make this theme not only highly professional but also very user-friendly. Fix & Ride is a very creative and multipurpose website theme that is perfect for all sorts of car repair businesses. This theme comes with a really clean and simple interface that is also highly appealing to the users. In addition to that the theme also comes with a lot of great features including the ability to generate shortcodes as well. Built on the powerful Visual Composer this theme allows you to build pages to your own liking. To top it all off the theme is also WooCommerce integrated that is perfect for all online businesses. 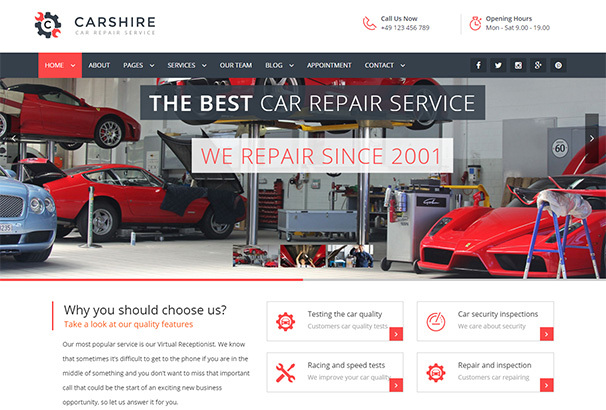 CarShire is a really professional and multipurpose website theme that can be used very easily for all sorts of automotive purposes. This theme comes with a lot of amazing features including an appointment form, blog section, multiple pages, contact information and social media sharing options as well. CarShire is the perfect combination of efficiency and outlook. With a creative design and compatibility with all screen sizes, CarShire is a great option. This theme was designed particularly for car repair shops, car washes, garages and workshops particularly among all other automotive services. The theme comes with a really professional and responsive interface. While the blue colour scheme gives the website a corporate vibe the imagery gives this theme a really friendly and attractive feel. Auto Car also comes with a lot of great features including practice areas, Q&A, team members page, case results and a free consultation/appointment form as well. 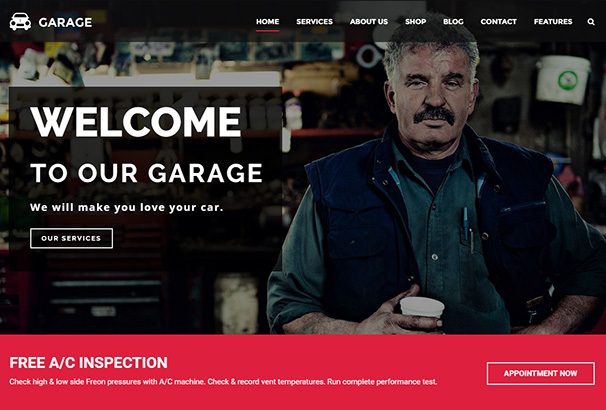 The perfect website for mechanics and car repair workshops, this theme was designed to give your website a contemporary and impressive vibe. The theme comes with a really responsive and engaging interface with a mellow colour scheme and clean imagery. In addition to that the theme also allows you to generate shortcodes and choose from a number of layout options. Garage is also WooCommerce integrated so you get to run a complete online store. With all its perks Garage is one of the most flexible and customizable themes that we have. 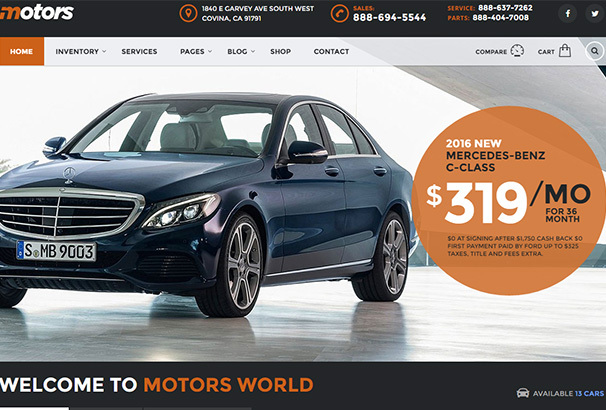 The ultimate stylish and contemporary website theme for car dealers, Auto Image has everything that a website needs to make it amazing. The theme comes with a really responsive and stylish interface with an image of an Aston Martin with a blue and red based colour scheme. In addition to its luxurious design this theme also comes loaded with amazing features including WooCommerce integration. This theme allows you to create a really fast and efficient website making sure your website is a hit. 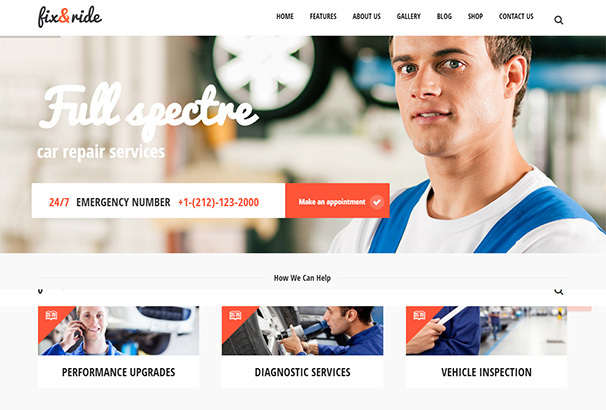 The perfect WordPress theme for automotive and car repair businesses in particular, Bengkel is bound to impress all your website visitors with all the perks that it has. It comes with a really responsive and clear interface that provides your visitors with a lot of important information right on the main page. In addition to the layout the theme also comes with a high speed and is compatible with all devices making it one of the most professional themes that we have. 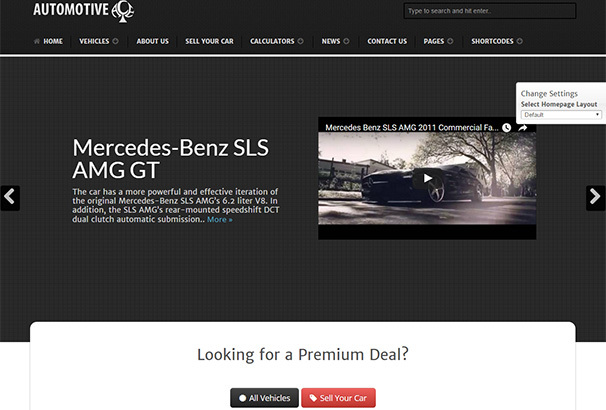 Auto Dealer helps you create a website that is one of the most user friendly and intuitive websites that we have. Using this theme your users not only get to experience a really high speed and efficiency, they also get to create profiles and register with your business or company. 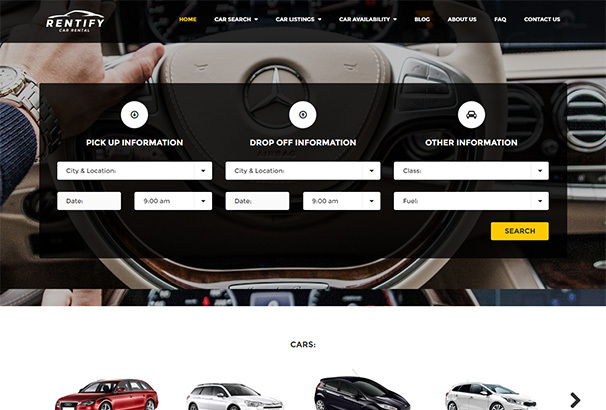 It has a really chic and sleek interface that shows the car search option right at the main page. The theme also comes with social media share buttons so you and your users can share your website on all social media as well. 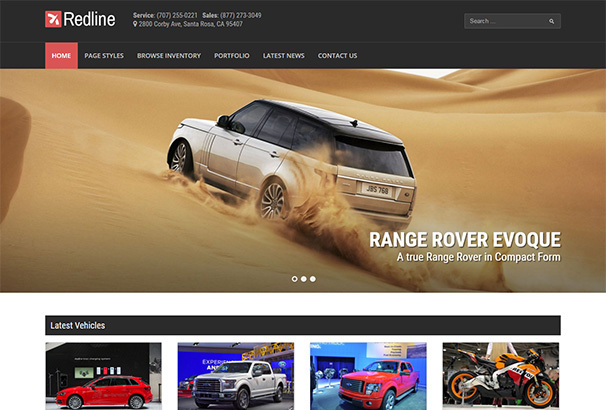 Automotive is a really stylish and contemporary website theme. Using this theme you get to create a really chic and classy website that is loaded with features as well. Not only does the theme come with a really responsive and aesthetically pleasing interface, it also comes with amazing features like WooCommerce integration as well making it one of the best themes that we have. 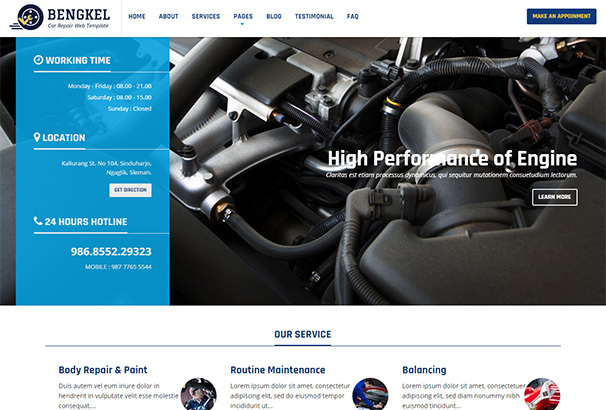 A really fantastic website theme particularly designed for a car wash or a workshop, Car Dinal has a really friendly and engaging interface. Without even doing any work you get to enjoy a really professional and clean website with Car Dinal. 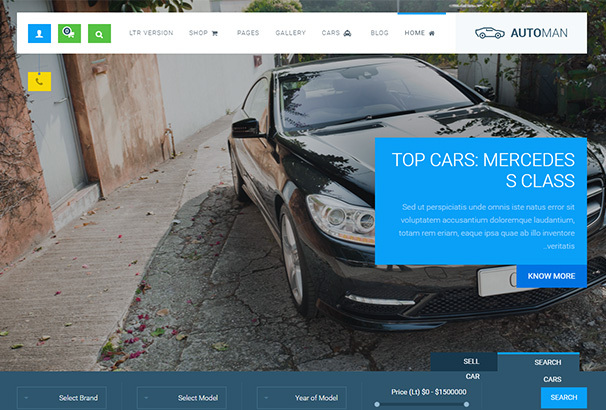 A really simple and minimal interface paired with a high speed and efficient functionality, Car Dinal is one of our most user-friendly website themes. Octane is one of the smartest and most intuitive website themes that we have. The theme comes with a really powerful $34 worth Pro Car Dealership Plugin that is built-in to the website theme. It has a really responsive and stylish interface that truly makes your content shine. Octane also comes with a very detailed vehicle inventory and a search option among other advanced features. 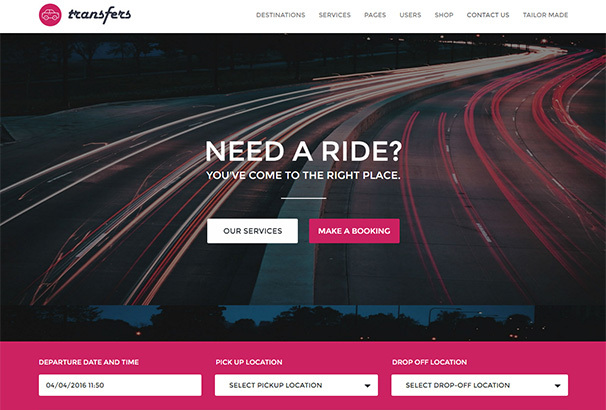 A really stylish website theme for an online car rental service, Rentify comes with a really modern and contemporary interface that engages the viewers and makes it easy to navigate the website. This theme also comes with a powerful car rental system plugin by KestutisIT that helps you make use of all the options that are necessary for running a really successful and efficient car rental service. 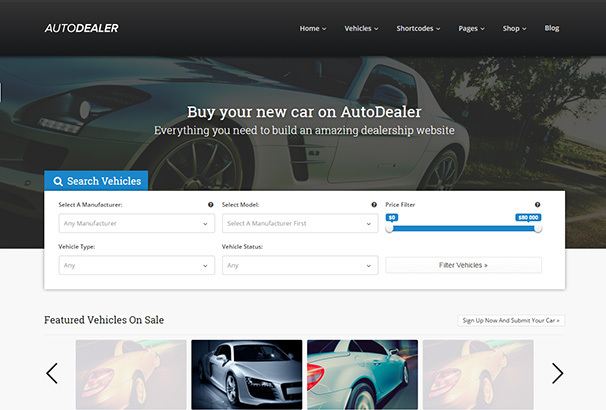 A premium website theme, AutoDealer is perfect for all sellers, auto retailers or car dealers. This theme comes with powerful website customization tools that really help you pack a punch with your website. In addition to the amazing features this theme also comes with a LayerSlider Plugin worth $15 and with WooCommerce integration as well. 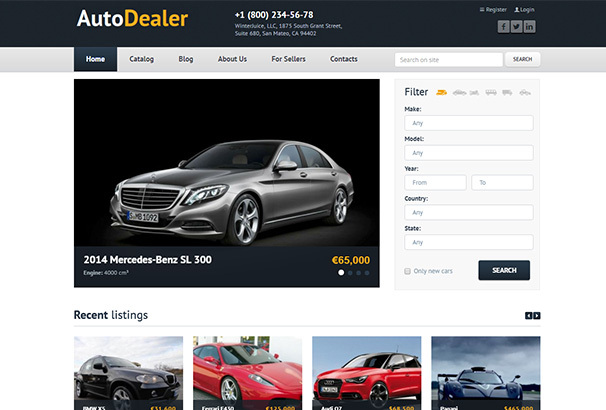 The sleek interface paired with high practical functionality makes AutoDealer one of the best themes that we have. Anyar is a really contemporary and luxurious website theme that has all that a user could want from an automotive website. 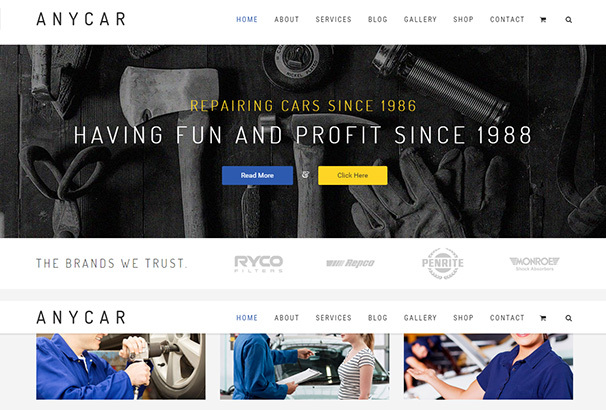 The most ideal website theme for a car business, a mechanic business or even a car repair service. With its easy one click installation process this theme allows you to make use of the high quality website that impresses all. The theme comes with eight different homepage options, three different gallery styles and more than three blog pages. In addition to all that the theme also comes with a revolution slider, a visual composer page builder and WooCommerce integration as well. AnyCar allows you to make use of a feature rich website without even touching a single line of code. Redline is a really flexible and highly customizable website theme that comes with a lot of amazing features. This theme comes with a really responsive and engaging interface that truly emanates professionalism and style. In addition to the layout the theme also comes with a lot of great features including a vehicle inventory as well. On purchase users also get to enjoy a really detailed help file to enjoy the most user friendly experience. 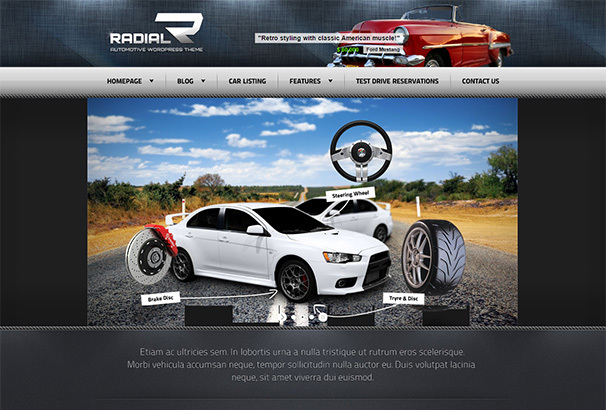 One of the best website themes that we have for tech or automotive related websites, Radial has a pixel-perfect and retina-ready interface that truly makes a statement with its design. While the layout promises to captivate all the viewers the amazing features help you create a complete and efficient website for yourself or your brand within no time. Owing to the HTML code this website theme is also highly customizable and flexible. 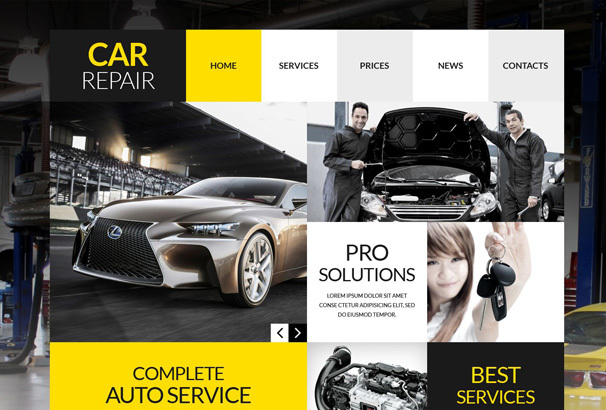 A really contemporary and elegant website theme, Caribion is perfect for all repair and car mechanic websites. THe theme comes with two different homepage designs that you can choose from and create your website however you like. It also has different sections for quote form, services and portfolio. This website is not only really responsive it is also compatible with all devices and screen sizes. Carell is a premium website for all real estate and car dealership businesses. This theme allows you to enjoy two website themes in one. 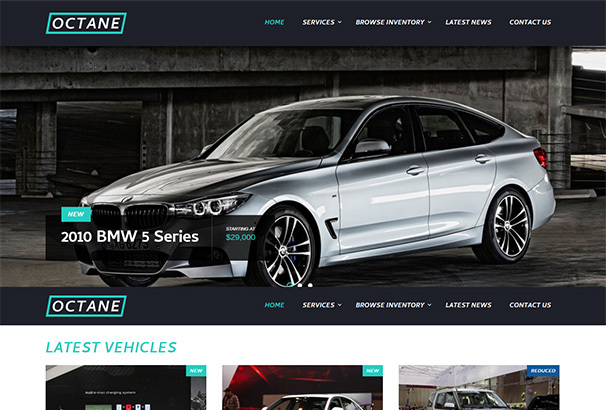 Perfect for any sort of car dealership business, this theme allows you to make use of the amazing grid-based interface as well as the amazing functionality of this theme. The theme also comes with an advanced search bar and the listings and allows you maximum control over your website. Automative Ace is a website theme that helps you create a really contemporary and modern website for yourself. The most ideal option for vehicle dealerships this website theme comes with a large number of options that users can choose from making the website highly customizable as well. In addition to that using this theme you get to approach all your potential clients and customers with the amazing tools that this theme comes with. Automative Ace allows you to present your content and business in a really amazing way with its chic and stylish presentation. 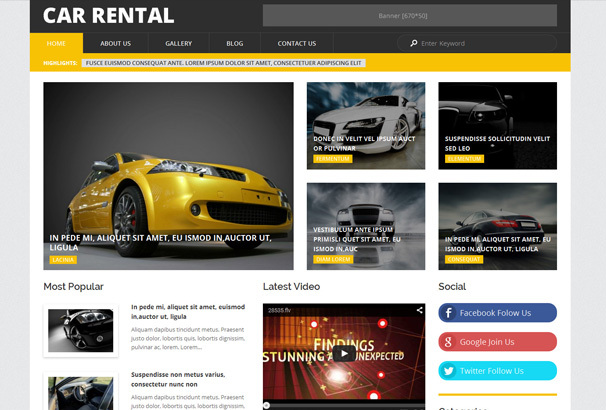 RentCar is a really direct and modern website theme that shows your viewers all they need to rent a car right on the main page. The layout consists of an image of a car and a booking-form giving your website a really professional look and making it very user-friendly. In addition to that the theme also comes with a really simple and organized design that makes your website a favourite among all minimalists. 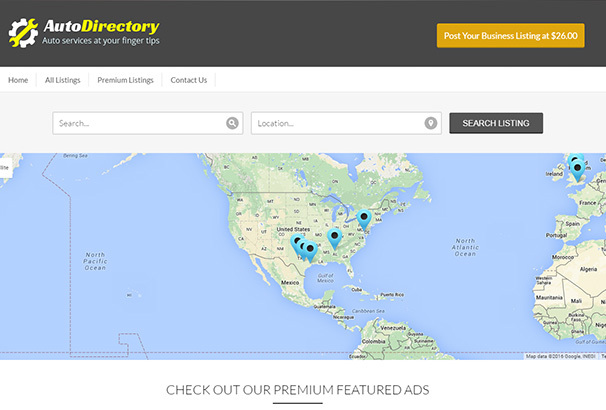 Auto-directory helps you create a really professional and corporate style website. Using this theme you get to create a website that is particularly suited for car dealers, car repairing businesses and automobile service providers. The interface comes with a google map that helps the viewers locate your stores making it easier for established businesses to be more accessible to the public. The theme also comes with a search options for services and stores and also shows listings in the homepage. 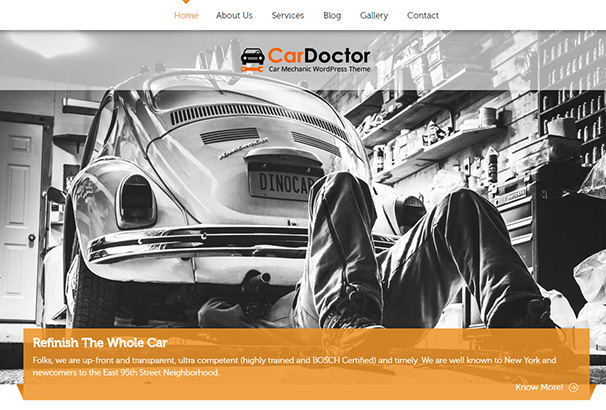 Car Doctor is a really classic website theme perfect for car wash, garages, car workshops and car repair shops. It has a really strong black and white interface with a hint of red that makes your interface stand out. In addition to the design the theme is really organize and helps you create and manage your business online in a highly professional way. With this theme you get to create a website where your services and potential customers are a click away from each other. 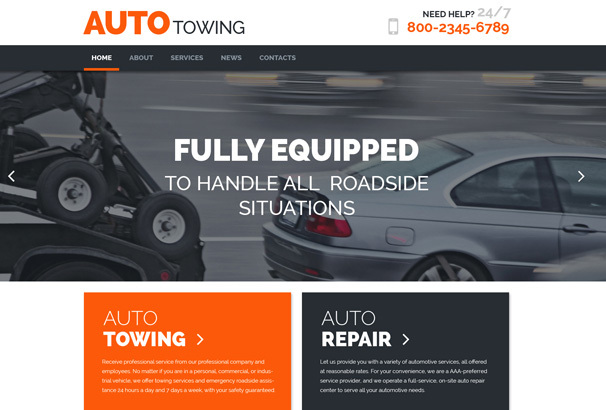 A great website theme for an auto-towing or auto-repair business, AutoTowing has all that you need to take your business online. The layout is direct and shows your visitors what you’re all about. In addition to that the theme also lets you create galleries and manage your services and expertise in a really professional manner that appeals to the customers. 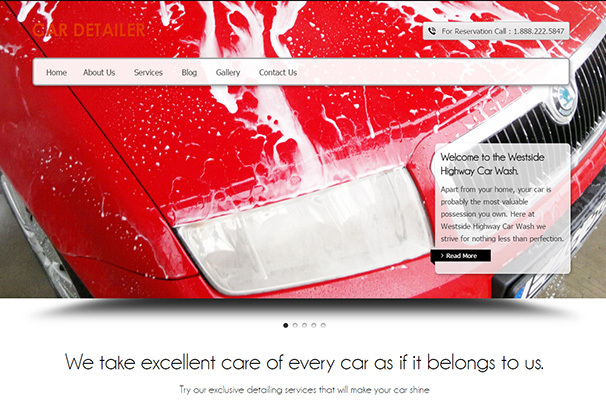 The perfect website theme for car detailing and car wash centres, Car Detailer is the complete package. This theme comes with a really modern and stylish interface. The colour scheme and imagery show your viewers how serious you are about your business with a high emphasis on style as well. This theme makes a statement with its interface and its features and is one of the best themes that we have. 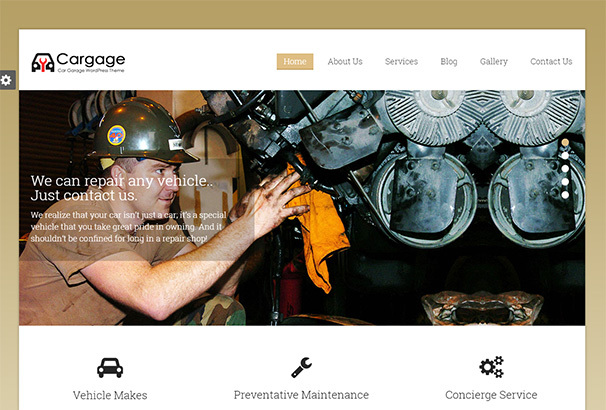 The ultimate website theme for automobile workshops, this theme allows you to create your very own online garage. Whether you are a beginner or an established business, this theme lets you showcase your brand and business to the world in one single place. The theme focuses on imagery to show the viewers what your website is all about. In addition to that you can also create galleries using this theme and add to the content in a really nice way. 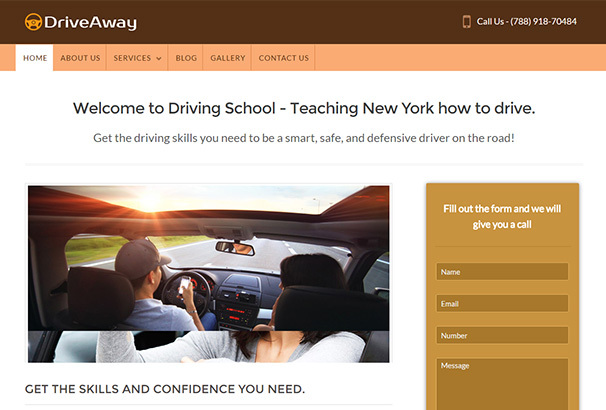 A really professional and contemporary website them for auto service centres and auto repair businesses, Drive-A-Way has all that a person may want from their website. This theme comes with a really subtle and professional interface that is perfect for corporate use. This theme is also very organized and through headers gives your website a structure. The theme also makes equal use of text and imagery in making your website a really appealing one. Some of these are really amazing, others, not so much. I saw this theme yesterday. good enough to be featured here? I simply needed this; I wish to express my appreciation for your generosity supporting those people who require help on this. I think AutoTrader is a stunning, responsive auto WordPress theme excellent for an online vehicle marketplace or an auto motor magazine or blog. Automotive. Motors. Auto Showroom. Nice article and pretty well covered. Turbo-WooCommerce Rental & Booking Theme best ideas and design techniques for designing website related to Automobiles and came across this article. Some of the sites you listed are very inspirational. Great work and thank you very much for sharing.